This was the last of the expandable 8's and was designed for reduced cost. The card size was increased in width to allow the CPU to be implemented on a single card. The rows of light bulbs on the earlier 8's have been replaced by LED digit displays and the switches by a keypad. This reduced the cost of the control panel. It was also not a standard part of the machine but sold as the programmer panel option. 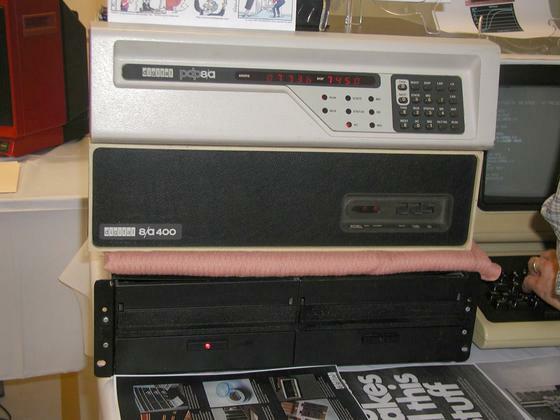 Many were sold for industrial control or dedicated use such as word processing where only the black limited function panel labeled 8/a 400 was needed to turn on and boot the computer. On the bottom is the DSD-440 8 inch floppy drive. It should have a plastic face plate but it was missing on the ones I got. It is compatible with the DEC RX02 floppy format but used its own 2131 controller card in the PDP-8. It is an intelligent drive using a 8085 micro controller so could format disks and run diagnostics independent of the PDP-8.